This guy has been putting it down for San Diego Hip Hop for a looooong time! 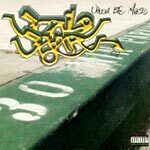 Nominated by the 2004 San Diego Music Awards for Best Hip Hop Album! Produced by Scribe Sayar. Live instrumentation: Bass on 1, 4, & 5 by Phil Osborn, Guitar on 1 by Issabella, Keyboard on 1 & 3 by Scribe Sayar, Guitar on 4 by Don Musial, Violin on 7 by Louis Nava. DJ on 1: DJ Syko.